When it came to Offensive Rookie of the Year honors, it came down to three guys who almost every other season would have run away with the award. After a slow transition to the league, Colts’ guard Quenton Nelson was dominant down the stretch and finished the season as PFF’s second-team All-Pro left guard. Giants’ running back Saquon Barkley was a home run threat every time he touched the football and finished with a top-5 receiving grade and rushing grade among starting backs. 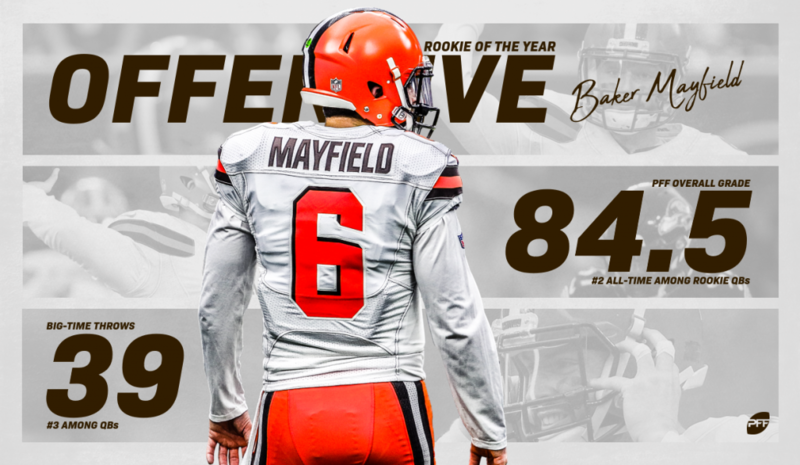 At the end of the day though, what Baker Mayfield did as a rookie at the quarterback position was historic. Mayfield earned the second-highest grade we’ve ever given to a rookie quarterback but unlike Russell Wilson – the previous leader – Mayfield achieved that grade in a pass-heavy offense. His 531 dropbacks were 55 more than Wilson despite coming in three fewer starts. What made Mayfield’s season special was his rare ability to throw down the field. He had 39 Big Time Throws, the third-most in the entire NFL, and that’s a big reason why he broke the single-season rookie touchdown passes record with 27. He fit the balls into windows down in the red zone that many quarterbacks won’t even attempt. Maybe even more importantly, he was already protecting the football at a franchise quarterback level. While he had 14 picks, he only had 15 turnover-worthy Plays – a fairly unlucky rate. Sixteen quarterbacks committed more turnover-worthy plays throughout the season, including MVP candidate Patrick Mahomes (19). Mayfield ended the 2018 season as the ninth-highest graded quarterback in the league. Higher than the likes of Matt Ryan, Carson Wentz, Kirk Cousins, and Ben Roethlisberger. If he had started the first two weeks of the season, there’s a real chance we’d be talking about their upcoming game this weekend. Mayfield brought back hope to a team that had none a season ago after going 0-16. He’s going to be giving defensive coordinators around the league headaches for a long time to come.